Large evergreen perennial with attractive foliage of large thick paddle-shaped, blue-green leaves. 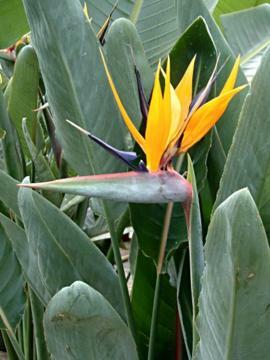 Tall stems carry the exotic looking, dramatic flowers, which are blue and orange, emerging from a hard beak-like spathe. Needs warm conditions and good light. Well drained, reasonably fertile soil with regular water during the growing season, drier in winter. Container grown plants flower best when quite congested, so re-potting is only done when really necessary. By division. Also from seed, but germination is very erratic. Often used as a cut flower. Good conservatory specimen.